The Franco-Prussian War was a turning point in the history of nineteenth-century Europe, and the Battle of Sedan was the pivotal event in that war. For the Germans their overwhelming victory symbolized the birth of their nation, forged in steel and tempered in the blood of the common enemy. For the French it was a defeat more complete and humiliating than Waterloo. Douglas Fermer’s fresh study of this traumatic moment in European history reconsiders how the mutual fear and insecurity of two rival nations tempted their governments to seek a solution to domestic tensions by waging war against each other. 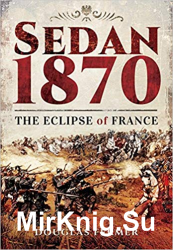 His compelling narrative shows how war came about, and how the dramatic campaign of summer 1870 culminated in a momentous clash of arms at Sedan. He gives fascinating insights into the personalities and aims of the politicians and generals involved, but focuses too on the experiences of ordinary soldiers and civilians.